We're all about the smartphones in today's daily tech briefing, courtesy of our friends at TechRadar. We've got news on the HTC U12 Plus launched today, as well as rumoured handsets from the likes of Microsoft, Xiaomi and Apple – here's what you need to know. We brought you yet another batch of leaks on the HTC 12 Plus yesterday, and now it's finally, properly here: HTC has announced its flagship phone for 2018, and it's bringing with it some very attractive specs, a sleek design, and a dual-lens rear camera capable of taking some excellent shots. 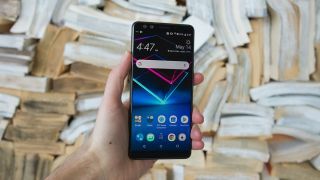 Click through to find out everything you need to know about the HTC U12 Plus, including full details on all the specs, availability, and launch pricing. 2. Are we about to see a Microsoft Surface Phone? Is the Microsoft Surface Phone real? From one phone that's official, to one that's very much still in the "rumoured" category. New code unearthed in the latest build of Windows 10 makes reference to a "Factory OS Andromeda Device", and that's led some to speculate that the fabled Surface Phone is indeed on the way – to go with all those other Surface gadgets Microsoft makes. Obviously it's all very much unconfirmed right now, but there just might be something in this. We've already reported on the revamped YouTube Music – the video platform's latest attempt to take on the likes of Spotify and Apple Music – and the updated apps are now making their way out to users, at least in some countries. For a monthly subscription fee of $9.99/month (international pricing to be confirmed), the new apps offer background listening and offline downloads to make it easier to listen to your tunes on the go. The big YouTube Music rollout begins: have you got access yet? What has Xiaomi got planned? There's plenty of talk online that the Mi 8 from Chinese giant Xiaomi could be the first mainstream flagship phone to offer a fingerprint sensor built into the display. If that's the case, we might get a look at the tech on 31 May – that's the date that Xiaomi has officially announced on social media, and it's namechecked the phone too. Most of the rumours we've seen so far point to a handset that's going to be high on power but low on price. Before Apple can unveil its 2018 range of iPhones, it needs to make the super-speedy processor chips to go inside them, and reports hitting the web today suggest the A12 chips have just gone into production. We don't know much about them yet, but you can be sure they'll provide better performance with a lower draw on the phone's battery, and that they'll be much talked about when Apple launches its next set of iPhones in September.